I mean, not quite. There’s a press conference this morning, and of course the show airs in September. But the big reveal happened yesterday, and for now, for me, it’s over. I could go on about how they took down the media tent 30 minutes after I arrived and how we were left to stand in the sun… or how the family’s ETA was 2-4 p.m. and how they actually arrived around 6 p.m. … or how I was on my feet for seven hours with one bottle of water and no food, without a break… but I won’t. Everything that three other photographers and I endured for so many hours — the sun beating down on us, the security guards’ keeping us in the media pen, the builders’ blocking our view of the family — led up to a single shot that I knew I had to make. And, despite all those obstacles and more, I was able to make that shot. So I’m happy. © 2011 by The York Daily Record/Sunday News. Brian Keefer, center, and his family react after seeing their newly renovated home for the first time on Sunday, June 26, 2011, in Newberry Township. Per "Extreme Makeover: Home Edition" tradition, the show's bus blocked the family's view of the house until host Ty Pennington, the family and 1,000 supporters shouted, "Move that bus!" I made some other shots, too, of course. So my editor is happy. © 2011 by The York Daily Record/Sunday News. 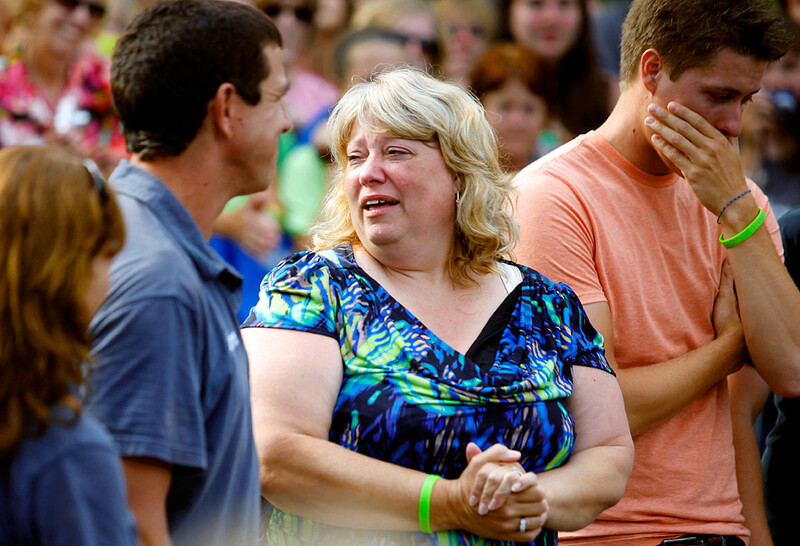 Dawn Keefer of Newberry Township reacts tearfully after learning that that donations by local community members and businesses paid off the family's $90,000 mortgage on their home, which was renovated by ABC's "Extreme Makeover: Home Edition." © 2011 by The York Daily Record/Sunday News. Production crew members complete finishing details inside and outside the Keefer family's newly renovated home before their arrival on Sunday, June 26, 2011, in Newberry Township. © 2011 by The York Daily Record/Sunday News. "Extreme Makeover: Home Edition" designers Jillian Harris, Ed Sanders, Tracy Hutson and Paul DiMeo try to rev up the crowd of supporters before the Keefer family arrived at their newly renovated home on Sunday, June 26, 2011, in Newberry Township. Be sure to check back with the paper for more wrap-up coverage! Also, the show airs on Sept. 25 on ABC — it’s the season opener. Awesome first photo! And all of them, but especially the first one! Enjoy this video we put together of the Keefer home makeover.